Now, here's the best part. On the new support site, there is no search box. So it appears I can't even search for it based on the previous article number. 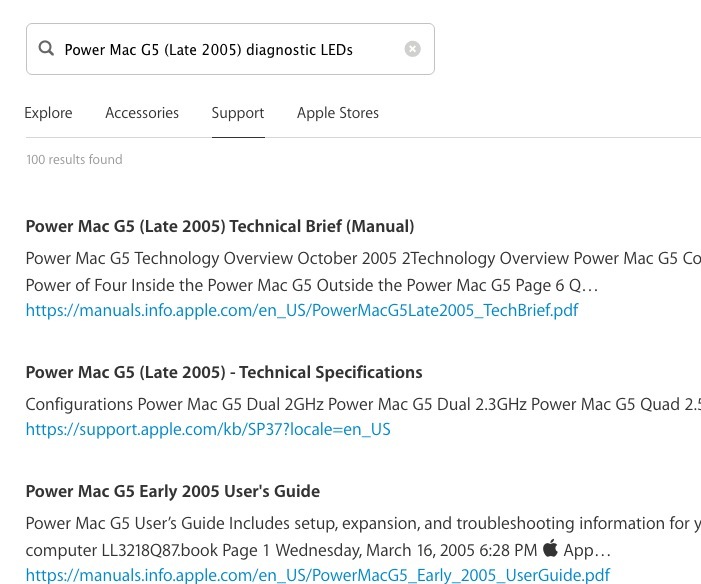 How do I reference previous support articles on the redesigned site? There's always archive.org's Wayback Machine. Of course, the archive doesn't necessarily have a copy the site or page you're looking for, and sometimes images and other resources are not available, but it's worth a shot. In this case, it looks like you're in luck! I'm with you, though -- Apple's support content not as well preserved as it ought to be. This support article doesn't mention beeps but only flashes and colors. The result is not very helpful though, despite the fact that the article is still available in the archive. I haven't been able to find it in the 100 listed results. Not the answer you're looking for? Browse other questions tagged websites .